Today I posted an entry on my blog with a link to yours. 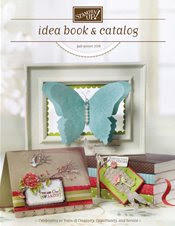 Love the card...the colors, layout and embellishments. Nice! Wow...this card is super cute Maria! I love red & white and the hearts and ribbon are awesome! Love this card! Always so many fantastic details! I luv it, always like that red & white look, it has such elagance! 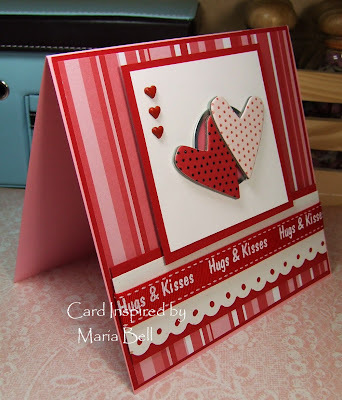 Beautiful card Maria. I love your work! Such a pretty creation, Maria. So funny about the camera... 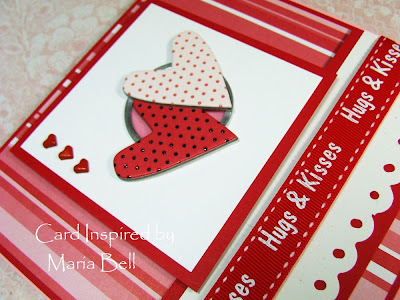 I thought the hearts were embossed with the swiss dots folder, until I got to the part that they are Heidi Swapp hearts... cool!! Cute heart brads too!!! Very cute card! and I love the reds!